It is Friday night and last minute decision of mine that I want to have a giveaway on this blog. I know it is Friday so let's make it fun just like the title with triple F letters. All items are brand new, cell phone charm is made by me. Prizes worth MYR$100 to be won. Above number 1 to number 3 I purchase online from forum but the sizes not suitable for me. 8. Comment in this post with your Follower id: , url of the giveaway, points you collected. 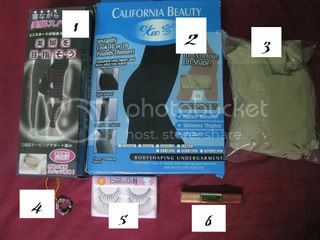 This giveaway open to blogger local and International, giveaway ends on 20 June Sunday, 2010 at 9pm (Malaysia Time). Just one winner so good luck to you! Winner will be chosen using random.org. Check out the participants with their points here. ooh, this is nice. too sad for malaysia blogger only. opps my mistake pressing wrong button. 10 points for the blog rolls and 10 points for blogging the giveaway total of 20 points. one more comment which I click wrongly by me. im so sorry to hear about your acne. i hope that you'll be able to find the one that will work for you. Have you tried a tomato mask (i made a blog post about it) i swear it does wonders on my skin! I made a blog post about stopping acne imo, you could check my label about acne. I hope that it would somehow help you. hope that your acne will go away asap. aw that's me rosa as a linlin. very nice giveaway... is it really just for malaysia blogger only? I'll be writing about this giveaway sometime this week... thanks for sharing it..
and ini entry I kay ..
sis She, thanks for reminding me .... Thanks really! had followed you long time ago... hehehe..
Good luck to me .. LOL! i hope i am still "IN" for your contest. I blog about your giveaway. I followed all your blogs on my blog list. I am a public follower. :) your blog is cute!